Leicester’s incredible season continues – they’re now five points clear at the top of the Premier League after this convincing victory. Manuel Pellegrini’s most interesting selections were down his left flank. Fabian Delph was fielded in a narrow left-sided role, as he was for the 2-1 defeat to Arsenal shortly before Christmas, while Pellegrini also selected his more attack-minded left-back, Aleksandar Kolarov. This was likely to be a key zone considering Riyad Mahrez plays on that side and Jamie Vardy often drifts towards the inside-right channel. Pablo Zabaleta started over Bacary Sagna on the opposite side. Claudio Ranieri rarely rotates his side – this was the fourth consecutive game he’d deployed this XI from the start. Leicester went ahead in the third minute, and therefore there was no ’settling down’ period here, no time for either manager to work out what the other was doing at 0-0. When there’s such an early goal it’s difficult to judge starting approaches because both teams are forced to react immediately, although in this situation we can be relatively certain Robert Huth’s opener simply exaggerated the expected pattern: Manchester City having lots of possession, Leicester playing on the break. That said, Leicester’s start was extremely positive. From kick-off they hit a long diagonal into Manchester City’s right-back zone, the ball went out for a throw, and Leicester boxed them in extremely aggressively. It was almost like this was a deliberate tactic: conceding possession straight away, but putting pressure on the opposition and making them nervous. It’s an approach that has, albeit rarely, been used before – and worked nicely here as Leicester regained possession in the opposition half, and attacked immediately. Leicester’s opener was an extraordinarily simple goal, with Huth turning a Mahrez free-kick towards goal, via a Martin Demichelis deflection. It was poor defending from the home side, who failed to cut out a simple, flat delivery into the box. But more interesting than the goal itself was the way the free-kick was won. Having won possession from the aforementioned throw, Leicester quickly switched the play out towards Mahrez on the right. Immediately, he was confronted with both Delph and Kolarov – the former positioned himself very narrow, determined to stop Mahrez moving inside onto his favoured left foot. The latter also took up a position that also suggested he wanted to show Mahrez down the line. However, both seemed surprised when Mahrez gleefully accepted the invitation to go down the line onto his right foot, where Kolarov was forced to foul him. 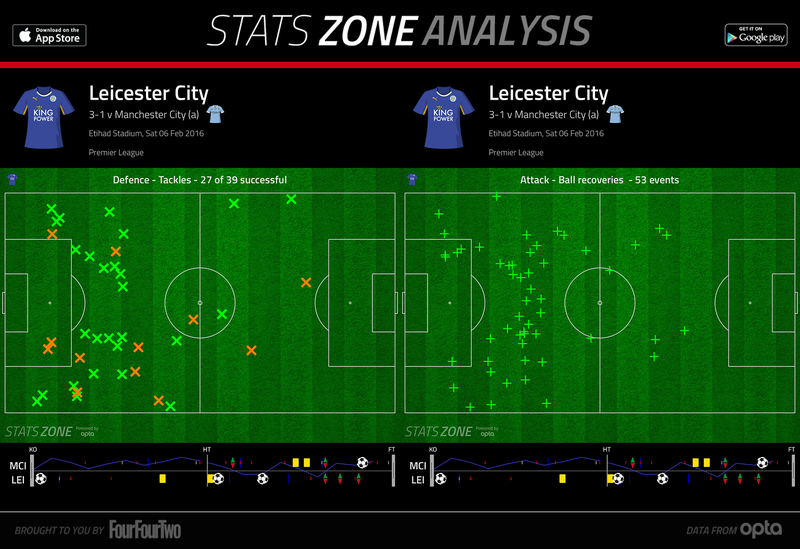 This shows that Mahrez has developed his game in response to stifling tactics from the opposition. It also meant Pellegrini’s use of Delph, to help Kolarov cope with Mahrez, hadn’t worked at all. 3 minutes in, and Manchester City’s gameplan was up in smoke. At 0-1, the game took its expected pattern. Leicester sat back in a deep defensive block in a rough 4-4-1-1 system, with Shinji Okazaki dropping back behind Jamie Vardy. The roles of the two forwards without the ball are crucial: Okazaki picked up one of Manchester City’s deep midfielders, usually Fernandinho, while Vardy would position himself intelligently to block simple passes from the centre-back into the other central midfielder, usually Toure. This disrupted City’s passing and forced them to go out wide to the full-backs. This is, of course, part of a more general gameplan. Leicester are able to play 4-4-2 (or, at least, two banks of four with two natural strikers ahead) because Vardy and Okazaki keep the side so compact and minimise the space the two central midfielders need to cover. Danny Drinkwater and N’Golo Kante only needed to engage with Toure if he moved forward in possession – otherwise, they could remain deep and protect the centre-backs. That, in itself, is important because Wes Morgan and Robert Huth are both, by Premier League standards, extremely slow. However, because they don’t need to move forward to shut down players between the lines, they never need to turn and run. The narrowness of the full-backs also helps in this respect – Danny Simpson and Christian Fuchs often concede space out wide. They shut down when necessary, of course, with the whole side moving across the pitch laterally to prevent gaps appearing in midfield, but Leicester’s main priority is absolutely dominating the centre of the pitch, a la Atletico Madrid. They almost always tackled and recovered the ball in central positions. 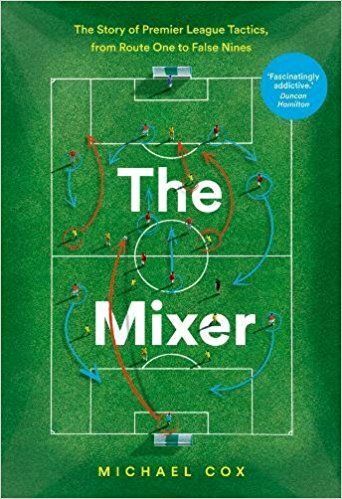 One moment, when Toure lost possession to spark a Leicester counter-attack, showed the away side’s approach – four players were converging around him, and the turnover was as much about collective effort as one individual challenge. This is why Leicester have made more interceptions than any other side this season, and only Liverpool have made more tackles. That said, City did have some encouraging moments in the first half, despite Leicester’s fine defensive showing. The first few good pieces of play came from David Silva, which was interesting as Silva is exactly the type of player, in terms of positioning, that Leicester were trying to suffocate here – he loves coming inside into the centre. Nevertheless, Silva is simply so good in tight situations that he was able to conduct play from small pockets of space, always glancing over his shoulder a couple of times before the ball came, and positioning himself on the turn to play the ball first-time. He nearly slipped in Raheem Sterling with a lovely through-ball. Manchester City did have some promising, if ultimately underwhelming, moments down the left flank. If Silva was simply playing well in a zone Leicester were trying to control, Kolarov was playing badly in a zone where Leicester were happy to concede space. Mahrez generally tracked him back, although sometimes remained in a counter-attacking position rather than dropping back into his own third, which probably made sense. Kolarov is, on his day, capable of providing excellent left-wing crosses, but here performed extremely poorly – and the only good delivery from that flank came from Sterling, drifting out wide towards the end of the first half with Delph moving inside more. Of course, there’s also the argument that Huth and Morgan are entirely happy to defend crosses against the diminutive Aguero, whereas they were terrified of his pace in behind. That said, Aguero scored a late consolation with a header from a cross, so they weren’t actually 100% secure in these situations either. The other problematic situation for Leicester came midway through the first half, when Morgan found himself high up the pitch, in a midfield role, and with the ball at his feet. After knocking a pass straight out of play, he then failed to recover his central defensive position quickly enough, and took out Aguero inside the opposition half. Later, in a rare moment where he needed to come out of defence to confront Aguero, he again fouled the striker, and was booked for persistent infringements. These were basically the exceptions that proved the rule: Leicester, and in particular their centre-backs, needed to sit deep and remain compact. The majority of the game, of course, was about Leicester’s counter-attacks. We all know about Vardy’s positioning in the channels, and it was notable that he often took up positions on the opposite flank to the ball, which (in theory) allowed Leicester to hit diagonal balls towards him on the outside of the centre-backs – he was clearly quicker than both. While Vardy and Okazaki took up deep positions without the ball, they sprinted into the box to become a goal threat – Vardy reached lots of long balls, while Okazaki was dangerous when Leicester played low crosses from the left. Leicester’s midfielders were given freedom to push forward at positive transitions, with both Drinkwater and Kante storming forward at different points, exploiting the fact that Manchester City’s midfield structure – as always when Yaya Toure players in this deep role – was poor. Fernandinho tried to cover the gaps, but often simply couldn’t. Leicester had various half-chances on counter-attacks, and shortly into the second half doubled their lead through Mahrez, storming through the centre of the pitch. An outstanding individual goal, there were a couple of interesting things here. First, Vardy and Okazaki made runs on the outside of the centre-backs, stretching the play and allowing Mahrez space to storm through the middle. It was notable that Leicester always covered lateral space well on breaks, with players surging from deep into gaps not covered by more advanced teammates. Second, like for the free-kick he won for the opener, Mahrez checked onto his right foot before smashing the ball into the net – which seemed to take Demichelis by surprise. When able to dribble either way, Mahrez seems almost unstoppable. The third goal came from another set-piece, again converted by Huth. If Leicester are to be champions this season, set-piece goals might be crucial, especially to open the scoring – they don’t really have great weapons to break down a packed defence (by title-winning standards) and therefore the odd set-piece opener could prove crucial, allowing them to play on the break. The game was effectively over at 3-0, although Pellegrini’s changes were interesting. The use of the defensive-minded Fernando in place of Yaya Toure showed Pellegrini realised how poor City’s midfield shape was, while Kelechi Iheanacho replacing Delph was simply introducing more attacking threat. The third change, with Bersant Celina on for Silva, seemed a determination to introduce energy and hard work more than anything else, although Celina whipped a cross onto the head of Aguero, with City finally taking advantage of the space out wide for their consolation. An outstanding performance from Leicester, and a pretty good summary of what they’ve excelled at this season – a deep, compact, highly organised defensive shape combined with quick counter-attacking. It’s simple on paper, but Leicester’s organisation without the ball is truly outstanding, and while earlier in the season they were relying on Vardy and Mahrez for moments of magic, they’ve now become more cohesive with possession too – the roles of Kante, Okazaki and Drinkwater have now become increasingly clear, and increasingly important. Manchester City’s gameplan was compromised by going behind so early, but this was due to poor defending – Mahrez got past two men easily on the outside, and then the defensive positioning for the free-kick was awful. City’s passing was too congested, with Kolarov the only option out wide and extremely disappointing with his delivery. Sterling in a central role was a peculiar move against a side denying space in that zone – he’s a player who needs space, and might have thrived out on the flank. Indeed, Pellegrini’s decision to play natural winger Sterling in the middle, and natural central players Silva and Delph out wide, meant City were unlikely to play around Leicester’s extremely narrow system. Thank you for the analysis Michael, good read as always. I think you’re spot on about the comparison to Atletico. And they did go on to win La Liga, on a year when the two big horses were performing below par. A similar story could be on the cards here. City and Arsenal have looked flat recently, with Chels out of the picture. 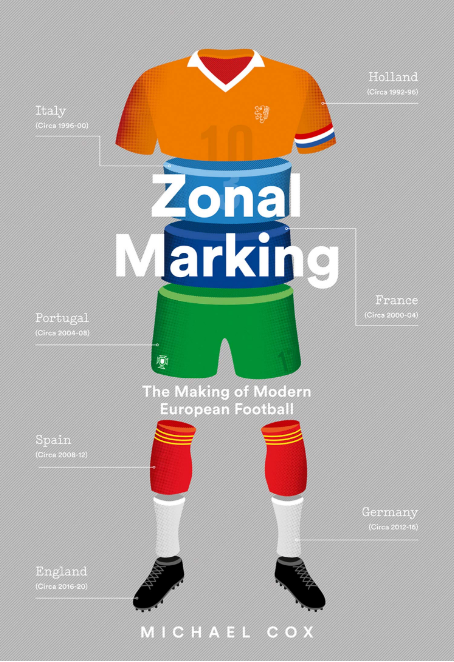 Only Spurs seem to have something really special in the works, and they’ve already been beaten by L.
Nice read, and just a week after the Barca – Atletico game – I sincerely hope that indicates you have found some spare time to do these kinds of analyses more regularly again! Interestingly, it’s the second time I’ve read the Leicester / Atleti comparison in the space of a few days – the other being here: http://twentyminutereads.com/2016/02/04/secrets-of-the-italian-4-4-2/. Seems pretty convincing. This obsession to play wingers in the middle is a strange one. Look at Guardiola playing Diego Costa the same way against Leverkusen and also failing there. I think Michael had an article in ZM around 2010 about the emergence of the “central winger” (what we then knew as the “di Maria role”).